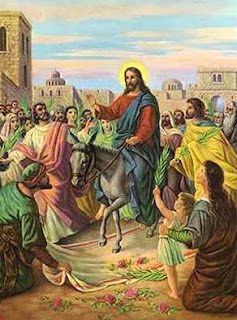 Today is the day of Palm Sunday. The day of victory. In fact, this Palm Sunday triumph of our Lord only led to His death. But we know that this death was not a failure. It was through His Passion and Death that He conquered the world and entered into His Kingdom. “I, if I be lifted up…will draw all things to Myself” (Jn. 12:32). So the Church asks the faithful to join in the triumphal Procession today as an act of homage and gratitude to Christ our King. This triumphal beginning to Holy Week is full of meaning. Although the violet Mass vestments and the Gospel of the Passion remind us that the Cross lies ahead, we already know that this is the means of victory. So the Chuch asks us to begin Holy Week by joyfully and publically acknowledging Christ the King.